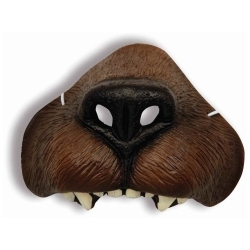 The bear animal nose is a quick and easy way to create a bear mask for both kids and adults. The nose can be used for theatrical and school productions, school projects, Halloween costumes, and year round costume dress-up fun. The bear animal nose is colored as pictured and is made of rubber. The nose has an attached elastic band for a comfortable and secure fit for both children and adults.